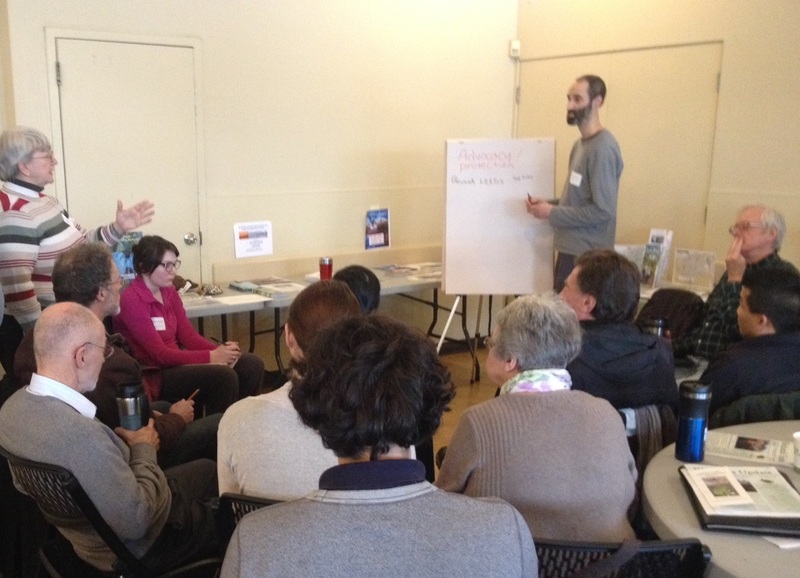 The BCWF Wetlands Education Program used 2015 World Wetlands Day – February 2nd – as the perfect occasion to host a very important workshop in the Lower Mainland. Entitled “The Future of Wetlands in the Lower Mainland”, the workshop brought together a wide range of stakeholder groups with an interest in protecting wetlands in the Lower Mainland in order to improve partnerships and collaboration between local stakeholders. Panel discussion on how to best support wetland conservation initiatives between local government and non-government. The workshop was designed to strengthen collaboration between government, non-profit organizations, conservation groups, and other stakeholders in the Lower Mainland. The Wetlands Education Program team, led by Program Coordinator Neil Fletcher, worked tirelessly in the months leading up to the event to bring together a broad representation of stakeholders with a direct interest in protecting wetlands in B.C. “We are very excited about this workshop and the fact that it will bring so many groups together in one place. We feel collaboration between all levels of government, conservation groups, and community stakeholders is critical in conserving and protecting our wetlands, and by holding this workshop we hope to spark some important conversations and relationships,” said Fletcher. The workshop, which was held at the Rowing Pavilion at Burnaby Lake Park in Burnaby, B.C., was an overwhelming success, attracting 130 participants, the highest attendance numbers of any working group workshop in the history of the Wetlands Education Program. The day consisted of a number of presentations by engaging speakers and presenters from a number of prominent conservation groups including Ducks Unlimited Canada, the Elk River Alliance, and the South Coast Conservation Program. A range of topics were presented and discussed, including an overview of the state of wetlands in the Lower Mainland, how government and conservation groups can work together on important projects, and enhancing local capacities to protect and conserve ecosystems at risk. While all of the featured speakers presented valuable information and were well received, several stood out as being of particular interest to the assembled group. Break out activity to capture how different organizations address wetland conservation issues in the Lower Mainland. Lee-Anne Walker, Executive Director of the Elk River Alliance, spoke about the strong relationships and collaboration between government and stakeholders that is required to make local watershed conservation projects effective. At the heart of Lee-Anne’s presentation were “five enabling conditions” that she and her group have identified as being critical to advancing watershed conservation initiatives that require buy-in from diverse groups of local stakeholders. Pamela Zevit, Coordinator of the South Coast Conservation Program, presented valuable information on endangered species in the Lower Mainland that are at risk due to disappearing wetlands. Her presentation also touched on the need for conservation groups to develop strong relationships with decision makers in local government, and she discussed the importance of a collaborative approach to land-use planning that brings local stakeholders together to face problems head on. Dan Buffett, Head of Conservation Programs – BC Coast for Ducks Unlimited Canada, gave a brief overview of the state of wetlands in the Lower Mainland and had some very positive things to say about the event. “Ducks Unlimited is very supportive of the Wetlands Education Program, which has shown strong leadership and citizenship on wetlands initiatives in B.C. over the past two years (since BCWF initiated working group workshops among regional stakeholders). We are here to bring people together to develop partnerships and relationships that will help advance important wetlands initiatives. Without collaboration, nothing happens,” said Buffett. Other speakers included Dana McDonald, Manager of Green Space Programs at Evergreen BC (best practices in wetland stewardship); Ivy Whitehorne, Coordinator, National Wetland Conservation Fund at the Canadian Wildlife Service (available opportunities for funding from the National Conservation Fund); Mark Sloat of the City of Burnaby, Liana Ayach of the City of Surrey, and Hailey Steiger-Tang of the City of Richmond. In addition to the guest speakers, the workshop featured important group discussions that worked to strengthen and foster collaboration among the stakeholders and groups present. Workshop participants were asked to identify shortcomings in information, political will & resources, and regulatory instruments & policy that they need to move forward with their various projects and initiatives. Discussion groups were then formed to discuss how collaboration and working together can help the various stakeholders overcome these shortcomings and be more successful in their contribution to wetland conservation. Breakout groups included exploring opportunities and interests in: 1) developing a regional restoration network, 2) developing a wetland communication network, 3) developing a research hub through academia, 4) Funding opportunities with the National Wetland Conservation Fund, and 5) enhancing public support and political will. Thank you to everyone that joined us at Burnaby Lake on February 2nd for what turned out to be a highly informative experience that generated a great deal of discussion and new ideas, and will hopefully lead the stakeholders present to form new partnerships and collaborate on important wetlands-related projects in the future. A special thanks to all of the featured speakers that took the time to put together an educational and informative group of presentations. This workshop would not have been possible without the generous financial support of the B.C. Wildlife Federation, Ducks Unlimited Canada, Wildlife Habitat Canada, and Environment Canada. ← Happy World Wetlands Day 2015!